During the month of October, I was able to visit the Irvine Nature Center twice. Once with my bird club and last weekend I went with my hubby. 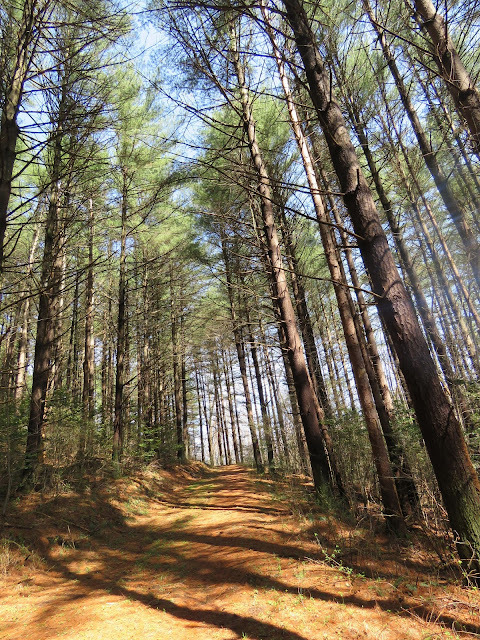 Of course the nature center trails were great for birding. But it was also nice to see some of the trees looking beautiful with their fall foilage. I was amazed at the amount of wildflowers we saw growing on the field. It was the third weekend in October and these flowers were looking gorgeous and still attracting the Fritallary and Buckeye butterflies and Sulfurs. 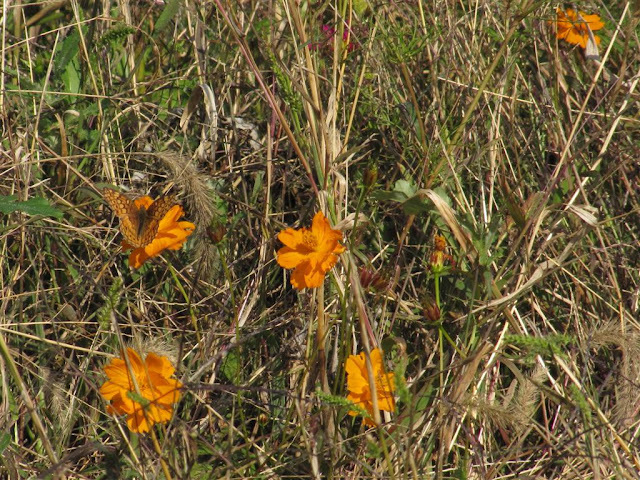 Can you find the Fritillary above, the butterfly almost blends in witht he flowers and background. The fields are great for attracting sparrows and this is a great time of year to see new and to compare different sparrows. They are one of the hardest birds for me to id, so many of them resemble other sparrows. My lifer seen at the nature center with the bird club was the Lincoln Sparrow. I tried hard to get photos of these sparrows but they seemed very camera shy. Talking about camera shy, can you find the sparrow hidden in the bush above? Sparrows seen both days were the Lincoln, White Throated, White Crowned, Swamp, Chipping, Field and Song Sparrows. I was hoping for a sighting of a Vespar or Grasshopper Sparrow. But, I was still happy with my Lincoln Sparrow lifer. 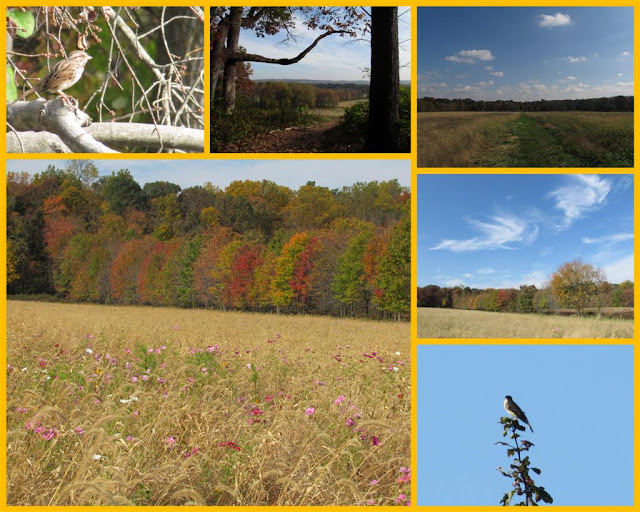 Above the mosaic, shows a sparrow, trails coming out of the woods onto the field, some fall foilage, the field of wildflowers and tons of sparrows. I was amazed at the amount of sparrow we saw here. Other birds seen were the Eastern Phoebe, woodpeckers, Hawks, Kestrel, Palm Warblers, Towhees, Canada Geese and we flushed a Snipe twice. It is hard to believe that this field today is most likely covered in snow. I was so happy that I was able to visit this Nature Center while these beautiful flowers were still blooming. visit with Today's Flowers and Scenic Sunday and Mosaic Monday. Thanks to all the wonderful hosts and thank you for stopping by to see my post. I hope everyone has a Happy Sunday and a wonderful week ahead. These are beautiful shots Eileen! Have a blessed Sunday! This is such a superbly beautiful place. I am so glad you went ack to it to see the wonderful fall colours and cosmos flowering wild in the meadow. Here I cherish them in the garden. I enjoyed all the shots and I love seeing flowers in a native habitat like this. I love to see the vastness of the field. It is the home of wildlife. I just love the fields of grasses with wildflowers dotting them. Beautiful. Looks like a great place to spend the day. Love the shots of the butterfly and the birds. What a place! The cosmos and the fall colours in the background are very beautiful! my little sparrows do the same thing....always giving me just a little peak!! it's odd to see the colors of autumn as the backdrop for such beautiful wildflowers!! of course the shades of pink and purple are my favorites!! Gorgeous! Too bad about the early snowstorm in your part of the country. Very pretty photos. 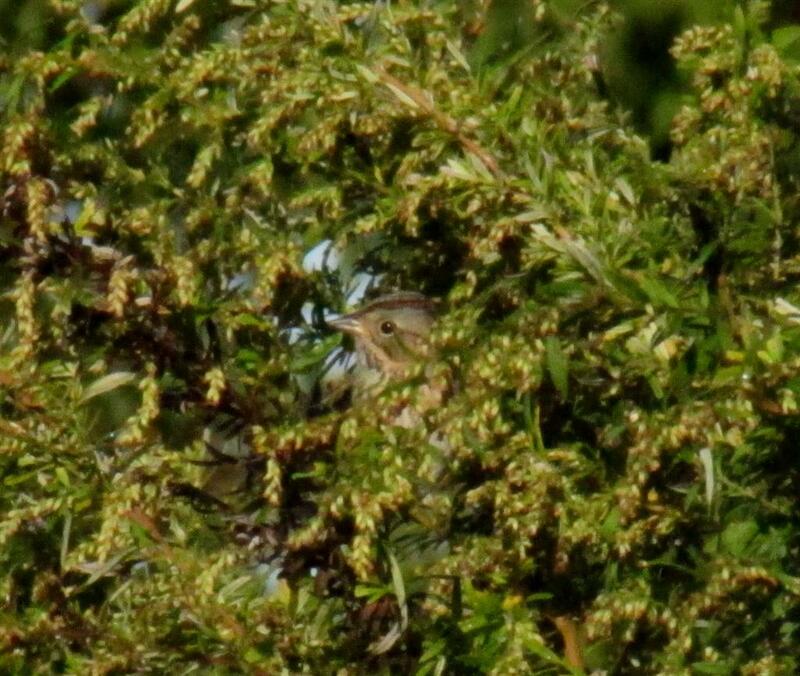 I love the sparrow hiding in the bush. What a beautiful spot. It looks like a great place to spend the day even if there hadn't been birds. The birds are a bonus. The Nature Center is beautiful, you got such stunning shots! What a lovely visit!! I'm so glad I stopped by. Sparrows were my nemesis for a long time!! Then I declared one summer as "the year of the sparrow" and worked very hard to learn the differences. Great captures of wildflower/meadow fields! The flowers blending in with the grass flowers look so lovely. What a beautiful place. The wild flowers are so pretty and it's obviously a wonderful place to see birds. Great pictures with the light and fall color. I love. What a beautiful place and such a lovely colors. Great series! I love the contrast between the flowers and butterflies and the autumn colours in the same photos! Over here we only have two species of sparrow, warblers are our most difficult small birds to id. That was a lovely visit through your camera. Such beautiful fields and flowers. These pictures are so beautiful. I read something in the newspaper this morning about the wildflowers disappearing in some areas of some of the European countries because so much weed killed had been used on the fields. I think that one mans weed is another mans wildflower and those pictures prove how beautiful nature is. 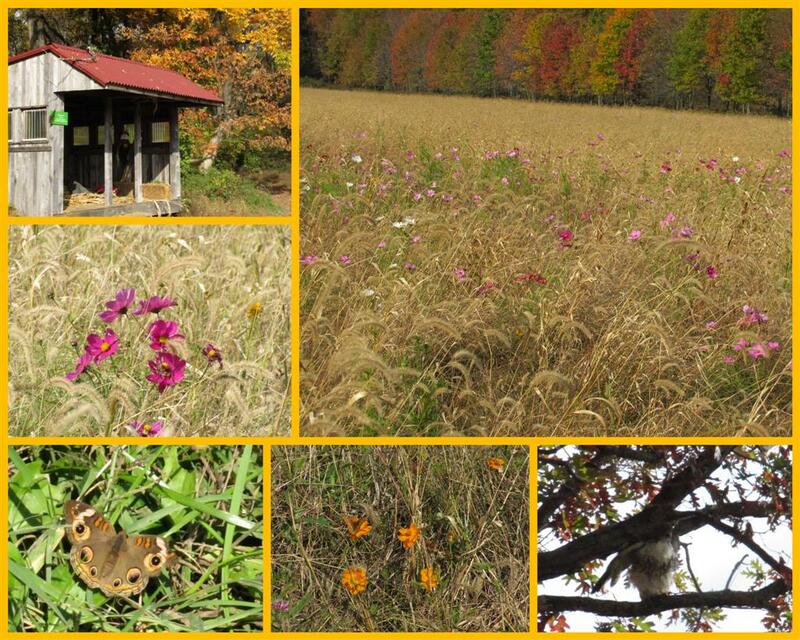 The grasses with the flowers and the fall foliage in the background is beautiful!!! I can only imagine what a treat that must have been to see in person! That field of wild flowers is amazing! Just a beautiful post Eileen. Gorgeous flowers around there, love them! You have a good eye for such beauties. What a lovely natural setting! You really captured the essence in the shot of the cosmos and the row of fall colored trees in the background. Hope your upcoming week is filled with more beauty. I do see the little sparrow and the butterfly, they blend in well with the foliage. The field of wildflowers is beautiful. The pink cosmos really stand out. I saw both cosmos and anemone on Saturday which seems very late in the season. You changed your header? It's beautiful. Love your meadows. The one with purple flowers in the center looks like they have been framed. They're all beautiful photos and the field looks nice with purple flowers growing. Hi Eileen, I love wildflowers, so I really enjoyed seeing the fields of wildflowers in your post - just beautiful. I am glad you have enjoyed them before the snow. Here we are having warm spring days - I think it is going to be a very hot summer. Have a wonderful week, and thanks for stopping by my blog to say hi. Hi Eileen, Your photographs are glorious. I love all of them but I have to say I the wildflowers are my favorites. The fall foliage color is amazing and the the little sparrow in the bush is so sweet. You've captured so much beauty here. Wonderful color! Looking at your shots of the nature center made me sigh!!! Gorgeous! Hi Eileen, Beautiful field with the Cosmos (I think?) and that Sparrow! I am back to blogging as of today as I have completed my move to a different home. Have a wonderful coming week! Very, very pretty the cosmos in the grass! All your photos are beautiful Eileen (as usual) but I love, love, love the color palette of those wildflowers; I could stare at those photos all day. Just beautiful (so are the trees in the background). So glad you got your photos before the snow dump! LOL! Thanks for sharing with us and hope you weathered your nor'easter okay! Wow cosmos are everywhere just awesome! Que fotos lindas, cheias de vida e dinâmicas! What beautiful photos!!! 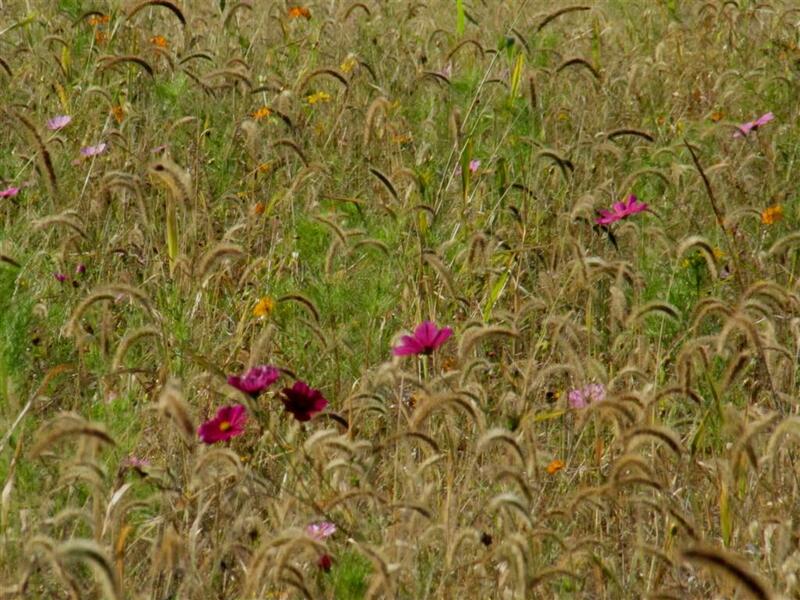 I was amazed to see cosmos still growing while the leaves are turning. Did you get much snow where you live in Maryland? I absolutely love the field with the colorful trees as a back drop! I wish I could get my wildflower areas to grow with such flourish. they have been spotty the last few years, even with replanting & burning this last spring. thanks for the beauty showcase! I loved the photo of the peeking sparrow. That is a keeper! What gorgeous flowers and fall foliage - and adorable bird shots too! Beautiful flowers. Love all your photos. Nicely captured. The butterfly's and the birds..are a delight and I didn't expect to the gorgeous wild flowers among the soft grass to be Cosmos! This is such a visual treat for me..one of my favorites is flowing grass and wild flowers. Just breath taking- thank you Eileen! Those are amazing landscapes of prairies, and the colors interspersed with brown are so beautiful. The critters hiding in them are also beautiful like the birds and butterflies. I am sure you had a very exciting photowalk. Eilleen, are you getting my comments? I know I commented on this post but do not see my comment here. Is anything wrong? Perhaps I DID comment on that last post and it also was wiped out? What a beautiful post -- and I loved playing 'find the hidden object' -- the butterfly really does blend in, but I found her! Gorgeous place. I see I'm very late in commenting but I am catching up (we're on the road). Hope all is well with you. These photos are amazing. I really love that one you are now using on top of your blog, so beautiful! And how great you were able to visit this place before the snow!